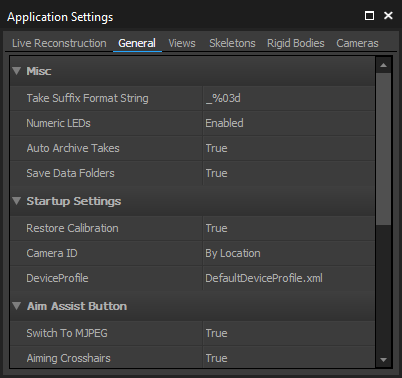 Reconstruction settings for post-processing reconstruction pipelines for recorded captures can be modified under the corresponding Take properties in the Properties pane. Disables or enables texture streaming of reference videos on the 2D camera viewport. Sets the color of selections in the 3D view port. Enables or disables timecode values displayed on the 3D viewport. Timecode will be available only when the timecode signal is inputted through the eSync. When this is set to true. 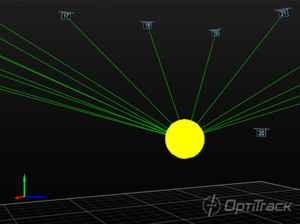 3D positions and estimated diameter of selected markers will be displayed on the 3D viewport. Preferred Layout to be used for the Live mode graph pane. Preferred Layout to be used for the Edit mode graph pane. This setting sets the time scope of the plotted graphs in Live mode. By default, this is set to 1000, which means 1000 captured frames of past tracking history will be plotted in Live mode. You can increase this to plot more history data or decrease it to zoom into the tracking history. Controls the maximum value of the exposure slider in Devices pane. This section covers through the display options for the calibration features. 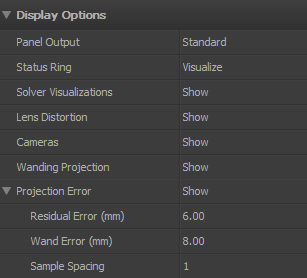 In previous releases, these options existed in the Calibration pane. A list of the default Skeleton display properties for newly created skeletons is listed under the Skeletons tab. These properties are applied to only skeleton assets that are newly created after the properties have been modified. For descriptions of the skeleton properties, please read through the Properties: Skeleton page. Note that this is the default creation properties. Asset-specific skeleton properties are modified directly from the Properties pane. A list of the default rigid body creation properties is listed under the Rigid Bodies tab. Thes properties are applied to only rigid bodies that are newly created after the properties have been modified. For descriptions of the rigid body properties, please read through the Properties: Rigid Body page. This section of the application settings is used for configuring the properties for all of the cameras in the tracking group. The settings include display options, masking properties, but most importantly, the 2D Filter settings for the camera system which basically determines which reflections are considered as marker reflections from the camera view. For Motive 2.0 and above. The 2D Object filter settings in the Reconstruction Settings pane have been moved over to the Devices pane. 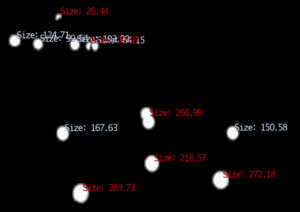 Toggles 2D object (Size and Roundness) filtering on or off. 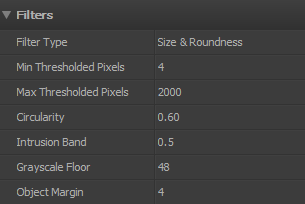 This filter is very useful for filtering out extraneous reflections according to their characteristics (size and roundness) rather than blocking pixels using the masking tool or the Block Visible feature. Turn off this setting only when you want to use every 2D pixels above the brightness threshold from camera views. When there are extraneous or flickering reflections in the view, turn on the filter to specify and consider reflections only from markers. 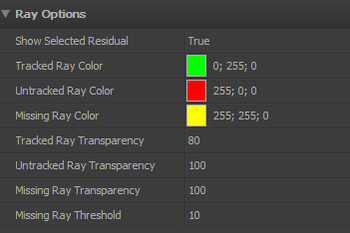 There are multiple filtering parameters to distinguish the marker reflections. Given that there are assumed marker characteristics, filtering parameters can be set. 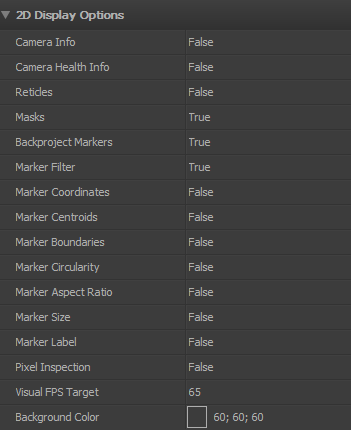 The size parameters can be defined to filter out extra-small or extra-large reflections that are most likely from extraneous sources other than markers. Non-circular reflections can be ignored assuming that all reflective markers have circular shapes. Note that even when applying the size and roundness filter, you should always Block Visible when you calibrate. The size filter applied with a maximum size limit of 200 pixels. Any reflections bigger than 200 pixel-size is omitted from the Point Cloud reconstruction calculation. The minimum pixel size of a 2D object, a collection of pixels grouped together, for it to be included in the Point Cloud reconstruction. All pixels must first meet the brightness threshold defined in the Cameras pane in order to be grouped as a 2D object. This can be used to filter out small reflections that are flickering in the view. The default value for the minimum pixel size is 4, which means that more than 4 pixels need a group of pixels needs to be greater than 4 for a ray to be generated. The maximum size of a 2D object, in pixels, in order for it to be included in point cloud reconstruction. Default is 2000 pixels which basically means that all of detected large reflections smaller than 2000 pixel-size will be included as a 2D object. Use this to filter out larger markers in a variable marker capture. For instance, if you have 4 mm markers on an actor's face and 14 mm markers on their body, use this setting to filter out the larger markers if the need arises. 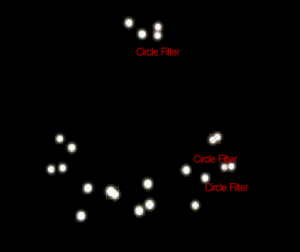 The circle filter omitting non-circular reflections from a 2D camera view. This setting sets the threshold of the circularity filter. Valid range is between 0 and 1; with 1 being a perfectly round reflection and 0 being flat. Using this 2D object filter, the software can identify marker reflections using the shape, specifically the roundness, of the group of thresholded pixels. Higher circularity setting will filter out all other reflections that are not circular. It is recommended to optimize this setting so that extraneous reflections are efficiently filtered out while not filtering out the marker reflections. When using lower resolution cameras to capture smaller markers at a long distance, the marker reflection may appear to be more pixelated and non-circular. In this case, you may need to lower the circularity filter value for the reflection to be considered as a 2D object from the camera view. Also, this setting may need to be lowered when tracking non-spherical markers in order to avoid filtering the reflections. The intrusion band feature allows cameras to recognize reflections that are about to be merged and filter them out before it happens. This filter occurs before the circularity filter, and these reflections are rejected before the thresholded pixels merge. This is useful for improving the accuracy of the tracking, because bright pixels from close by reflections may slightly shift the centroid locations. The intrusion band value is added to the calculated radius of detected markers to establish a boundary, and any extraneous reflections intruding the boundary is considered as the intrusion and gets omitted. When an intrusion happens, both intruding reflection and detected marker reflection will be filtered out. The grayscale floor setting further darkens pixels with lower brightness intensity values. The object margin adds an additional margin on top of the intrusion band for filtering out merged reflections. Lowering this value will better detect close-by reflections, but may decrease the accuracy of the centroid positions as a tradeoff. Sets the name for the selected camera group. Sets the color for camera group members as they appear in the 3D viewport. Color values are input as standard RGB triplets. Selects whether cameras in the group are displayed in the viewport. By default, only the Prime Color cameras that are equipped with the IR filter switcher are shown in the 3D viewport and Prime Color cameras without filter switcher are hidden. 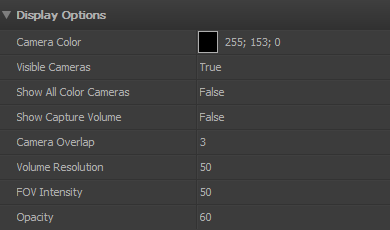 When this setting is set to true, all of the Prime Color cameras will show up in the 3D viewport. Selects whether the capture volume (defined as capable of tracking a single marker) is displayed in the viewport. Enabling this will allow the volume to be displayed as a wire cage around the ground plane where multiple cameras fields of view intersect. Valid options are True, False (default). Sets the minimum camera overlap necessary for a region to be visualized as part of the capture volume. Higher numbers represent more camera coverage, but they will tend to reduce the size of the visualized capture volume. Valid range is 1 to 25 (default 3). Sets the resolution of the capture volume visualization. A higher number represents a more detailed visualization. Valid range is 1 to 120 (default 50). Sets the opacity of the FOV visualization. 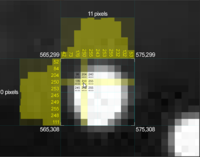 A higher value represents a more opaque volume visualization. Valid range is 1 to 100 (default 50). Sets the opacity of the volume visualization. A value of 1 is transparent and 100 is opaque. Valid range is 1 to 100 (default 100). Determines how late camera frames are dealt with. Timely Delivery will drop late frames, which is ideal for real-time applications where data completeness is secondary to timeliness. Complete Delivery will hold up processing of frames when a frame is late. Automatic, which is the default and recommended setting, runs in Timely Delivery mode until it gets a non-trivial percentage of late frames, at which point it will automatically switch to Complete Delivery. Delays the shutter timing of selected tracking camera group for N microseconds. Sets the extra pixel coverage (width) for masking visible markers when the mask visible function is used. A larger number will block a wider grouping of pixels simultaneously. Valid range is determined by the resolution of the cameras. Sets the extra pixel coverage (height) for masking visible markers when the mask visible function is used. A larger number will block a wider grouping of pixels simultaneously. Valid range is determined by the resolution of the cameras.